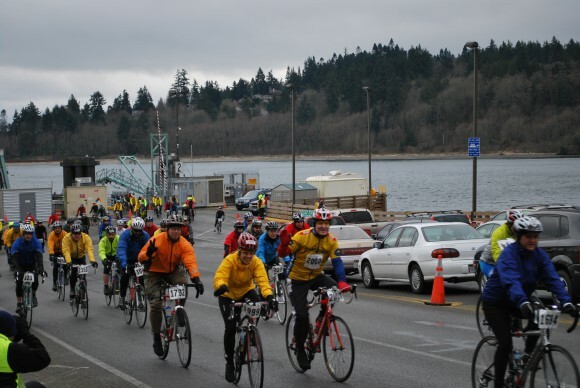 Riders unloading off the ferry for the Bainbridge Island Chilly Hilly in 2011. Next Sunday Bainbridge Island will be crawling with cyclists for the island’s largest recreational race. Over 2,600 feet of chilly hill climbing and a 33 mile ride draw BIG crowds every year – 6,029 registered riders in 2010. Folks come from near and far to brave the hills and make the classic loop around Bainbridge. For a great map of the ride, check out this Bikely Map. The official race runs from 8am to 3pm and starts as you unload off the ferry or from the top of the ferry ramp at Winslow if you are starting on the Bainbridge side. The ride is sponsored by the Cascade Bicycle Club, check out their site for more race details. The race culminates at Battle Point Park with a Chili Feed sponsored by Squeaky Wheels Bicycling Club. And proceeds from the race support ten local charities. To register for the Chilly Hilly Race –CLICK HERE. 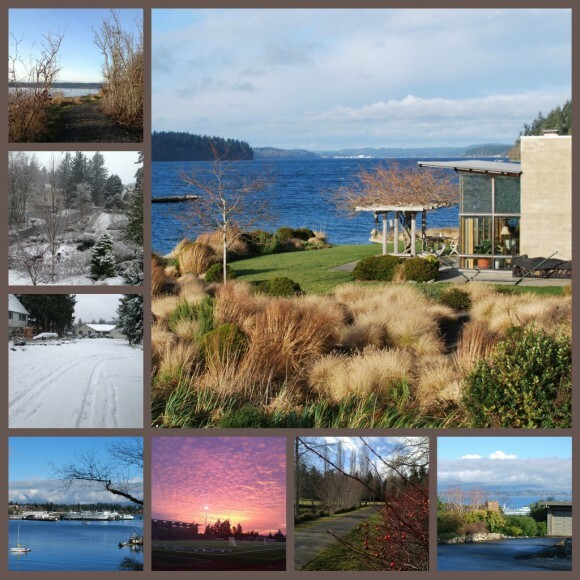 Chilly Hilly – February 26, 2012 – Organized by the Cascade Bicycle Club. Keep your eye on the prize - the house, not the furniture. If the seller’s agent and seller see your loan letter comes from out of state or from a big bank (with a central call center) it may give them pause and a negative check in your column. Why? 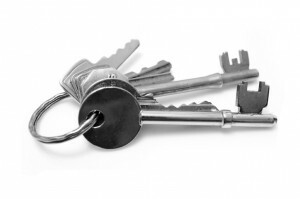 Agents know the local lenders and brokers and they know which ones get loans closed. Many big banks don’t assign one specific person to a loan, which can make for problems/delays in a transaction and delayed closings. A trusted, local lender/broker is the go-to person during the transaction and having one on your team will add confidence to your offer. If you do not need to ask for closing costs – don’t. And this is not the time to worry about furniture or porch swings. You want the house, keep your focus on that. Even though your offer may net out the same as another offer in the pile, I have heard sellers say more than once “I don’t want to pay someone to buy my house.” Paying for closings costs is a mental thing for many sellers. Some sellers could care less and do just look at the net price. But others are emotional and again it can put a negative mark in your column. Sometimes the price is not the only big concern of the sellers. Timing is often the reason many deals fall apart or don’t come together at all. The sellers may have bought another house already or the family may be separated because of a job. The sellers could want a quick close to move on or a long escrow period because they still need time to find a house. Have your agent find out what sort of timing is important to them and if you can make the closing date favorable to the seller in your offer. It could earn your offer big points. Have your agent ask questions. Many sellers want buyers to want and appreciate their home. I have had buyers earn big points because they really wanted the chickens and chicken coop. The sellers wanted to leave the chickens in good hands. It inadvertently earned my buyers points to ask for the coop and chickens in their offer. And, don’t assume the sellers want to take things like appliances. They may not want to hassle with moving them or their new house might already have them. Ask. Many times the winner of a multiple offer situation has the largest down payment. The larger the down payment, the more solid the buyer looks to the seller and the lender and the seller has less concern about the financing falling apart. Sometimes you can’t control this – you may only have 15% to put down when your dream house comes on the market. But, think outside the box for a few minutes and see if perhaps you have a relative who can gift you some money or if you can borrow from your retirement. Better to think about these things before you put in the offer rather than after the fact. In many cases you will see a “winning offer” have 30-50% for the down payment. Ask your agent whether or not they present their offers in person. Whenever possible I do, and I suggest all agents do, especially in a multiple offer situation. If your agent can sit down with the listing agent and the seller that is ideal. But, above all this offer should not just be faxed in. Your agent should sit down face to face with the listing agent and tell your story. In addition the buyer or buyer’s agent should write an introductory cover letter about the buyers and their offer. A lot of things get said, but it is nice to have a letter for the sellers to sit down, read, and refer back to. See your story in black and white. If you love the garden and the charm of the house, the sellers will likely want to see and hear that. Don’t think of it as an initial offer that will get countered. If there are five other offers the sellers will choose the best one and accept it, or they will choose one to counter. But, you want yours to be chosen, period. If they counter your offer and you were already at your max, you can counter them back at that original price. Your offer was chosen because it was the best one for the sellers and you may very well get the house at that first price. But, with the other offers out of play you are dealing with the sellers one on one, and that is right where you want to be. Wait, what? I never recommend buyers waive an inspection, but the sellers may have had a pre-inspection done by the inspector you, the buyer, would have chosen. If the sellers let you see the inspection, it can give you valuable information about the condition of the house and factor in to your offer price. Also, even if you choose to do another inspection, you can cut the inspection period down to say 5 days from the standard 10. Make a call to your inspector to find out if that is doable with their schedule. Sellers love a short inspection contingency period because the inspection is often the largest hurdle in the transaction and all parties breathe a sigh of relief when it is over. Different factors look good to different sellers. Know that when a seller gets three or four offers on their home, if their agent is savvy, they will make a spread sheet laying out the attributes of each offer. Like I have mentioned above you want as many plus marks in your column as possible. And yes, you will not always come out on top. It is disappointing. Very. But if your offer is not chosen, see if the sellers will take your offer as a back up. If the first deal falls through, your offer will automatically slide into first position. Many buyers think they might just prefer to watch it and see if it comes back on the market. But if it does come back on the market, you could be right back in another multiple offer situation. With a back-up offer you avoid all of that. Where there is smoke there is fire. Don’t wait around for someone else to submit an offer before you decide you like the house. Examine the house in regards to how it fits your needs and budget. Don’t wait for someone else to like it to make it look appealing. That will only drive the price up. Take some time to make your decision, but don’t wait too long. If you trust your agent (and I hope you do or you should choose another) and they tell you the home will go in two days, listen to them. They work in the market every day and have a keen sense of the ebb and flow of the market. Buyers have a lot more negotiation power when they are the only offer on the table. Some of these things you can’t control, but some you CAN . . . Most of the time when buyers miss out on a house it is because of a factor they could not control like their maximum buying price or the size of their down payment. But many other factors like which lender they choose, the closing date, or writing furniture into the offer – are under their control and those factors could be the tipping point for the offer. Imagine your offer on that spread sheet next to the other offers. Many buyers can think of how their offer will look to the seller, but buyers also want to consider how their offer will look up against other offers. That simple shift in perspective could make all the difference. About the Weather . . . Does it Really Rain All the Time? There is a poster you can buy in souvenir shops in Seattle that we locals find amusing. It says “We Turn the Rain Off When You Leave.” Kinda true. My parents look at the weather forecast from their sunny patio in California and gasp in horror of images that look like this. 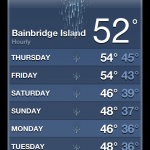 Bainbridge Island Weather – looks scarier than it really is. To the folks down south the rain looks kind of scary. Seattle certainly has its reputation. And, for the most part we locals are ok with it because we consider it population control. But, I am leaking out some of the truth here. All of the photos above were taken in the last few weeks. All on different days. 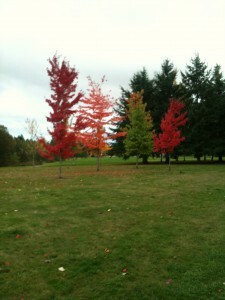 All demonstrating that the Seattle area is not always gray. No way. The rain is not constant, nor is it a pouring rain (usually). It is typically more of a drizzle and usually does not last the entire day. I do wear my trusted North Face rain jacket most of the winter (I consider it part of my uniform), but I don’t carry an umbrella or even wear rain boots. So, on the weather forecast it might show rain, and it could very well rain, but by 2pm the sun could be out. But, the weather forecast does not seem to change – again our form of population control. The grey is also what folks ask about and fear. I will be honest and tell you grey and green are the predominate backdrop for our lives from November to May. Many a day. But, do know it is NOT constant. The sun does come out and give us much needed breaks. Do we have five days straight of grey? Sometimes. But, to balance that out we just had five days straight of SUN too. And yes, was it fabulous. A few days a year, we get the white stuff too. This year we had about a week of it and the local news always comes up with clever names for it. Like this January it was, Snowpacalypse. In 2010 it was Snowvember. In 2009 it was just the Snow Storm, not as clever, no. But the news makes a big deal about it because, unlike cities like Chicago, we aren’t super prepared for snow. We don’t have fleets of snowplows or de-icers. So, the world sort of stops for a few days. The kids get snow days (hurrah) and most people do not have to go into work. Over the last five years it really has not been a major inconvenience in our life. As long as the power stays on, we are good. But, yes, folks do lose power, but most people around here are prepared with back-up generators, wood stoves or propane stoves (things I chat with newcomers about when they buy a house here). As long as you have a secondary heating and cooking source, you are in pretty good shape. And a 4 wheel drive helps too. My kids love the snow because snow = sledding. For three or four days a year, the kids get to sled around the hills in the neighborhood instead of going to school. A nice winter treat. So, this has been my biggest adjustment. Because Seattle is much farther north than Northern California, getting darker earlier in the day has been the hardest thing for me to get used to. Much of the winter it is dark, dark, termed “dark o’clock” by one of my funny friends, by 5pm. And it is still dark at 7am when I am getting the kiddos up for school. It is very challenging not to hunker down and drink hot cocoa at 6pm and be in for the night. Getting out and staying active, even in the dark, can be challenging, but not impossible. I can say I have adjusted and stilll get out in the evenings for meetings, gatherings, and even running. The flip side to the dark in the winter is that in the summer it is light at 5am and still light at 10pm at night. It is hard to get the kiddos to bed when it is light . . . but mine just stay up. And it is oh so delightful to be out at the beach at 9pm at night or gardening in your garden after dinner. The light is just different from what I was used to. An adjustment. One I can say I have made after five years. It does exist. Really. Again, note the photos above. We just wrapped up a fabulous five day stretch of sun. It still might be cold, like 45 degrees. Mid-westerners insert chuckle here. But, the sun does come out and much more than I expected it would in the winter (again, when I was in CA watching Frasier and imagining Seattle weather). And when the sun comes out here, with the water, the snow covered mountains, the green trees, the eagles, and the ferries . . . it is pretty darn spectacular. Breathtaking really. I love being outside, love exercising outside and I have found that I get out and get more exercise here than I did in CA. I love running and walking alongside the water and the cool air and temperature are terrific for running (unlike 100+ temperatures in the Sacramento summers). So, do know it does get grey. And it does rain. 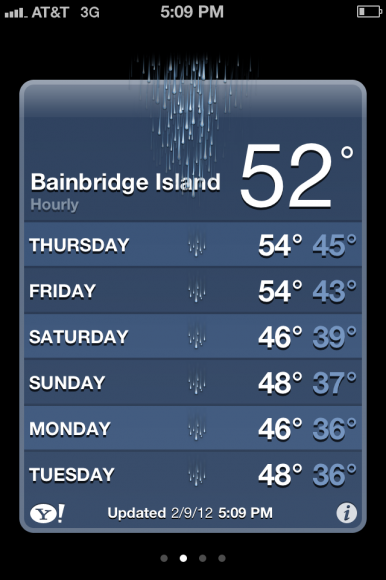 But, although the forecast for this week looks like ick on the iPhone, it is just our little secret weapon. The rain, although part of the local color, is not constant. I will still get out and walk and run six out of the next seven days, alongside many other active islanders. And I hope to see you and the sun while I am out there.